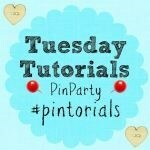 A big welcome to our week 4 of the Tuesday Tutorials Pintorials Pin Party! It is almost the end of the month! How are your new year resolutions holding up? I wanted to exercise more and it’s so far so good – I’ve been covering 3,000 steps a day. This week I am featuring Chinese New Year children crafts. Less than a month to go before our New Year! This coming CNY is the year of the sheep/goat. So firstly, I’d like to share this Painted Cotton Sheep from Sand in My Toes. This is such a great craft for young children. All children like to paint and make lots of mess! Next is from Hodge Podge Craft who used a dragon template to make this gorgeous dancing paper dragon. Last but not least, There and Back Again A Mother’s Tale made this beautiful paper fish kite! I would love to make and hang one of these! So beautiful! Don’t forget to pop by to take a look at Kate (Valentine Days crafts for children), Anna (wearable valentines craft) and Hodge’s (sensory activities) blogs to see who is featured this week.